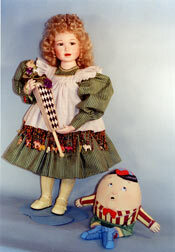 Limited Edition dolls 25" to 30"
Limited Editions Dolls 25" to 30"
Alice stands 27" tall. Alice is costumed with an Elizabethan flair. pop up hand puppet are included.